4.2 Perception of Real World . . The smart phone market has seen rapid development in the recent years. Since the first blackberry was introduced for business users in 1999, it took 8 years until smart phones were sold for the mass consumer market, beginning with the iPhone in 2007, as described by Hall et al.. After the success of the iPhone many other vendors started offering smart phones for the mass market and, since CQ4 2010, more smart phones/tablets then computers/laptops have been sold. Considering the size and growth of this market, it is only natural for the video game industry to offer games for smart phones. According to the iTunes charts for the best selling paid apps 2009, the most sold games that year were ported versions of popular video games like e.g. the SIMS 3. From then on, the game industry started heavily utilizing smart phone specific features like the touch screen or the gyroscope. In partic- ular, the touch screen is no longer only used to push buttons but it is used to create a different gaming experience, as for example done by the game ”Fruit Ninja”. The iTunes charts for the following year show that applications making heavy use of these features sell better. This trend continues in 2011 indicating that consumers react positively to the utilization of these features. With more powerful smart phones that are constantly connected to the Internet, it becomes possible to use other smart phone specific features for gaming. One of these features is the GPS sensor built into most currently available smart phones. Builtin functions to determine the phones position make it possible to change the game experience based on the geographical position of the player. These location-based games can create an entirely new gaming experience. The game is no longer taking place in the living room, as it moves with the user. Different to traditional handheld video gaming devices, location-based games can incorporate the environment into the game thus blurring the line between game and reality. Heavy use of these features leads to a new way to play and also to new game design methods. Besides the possibilities and chances that come with location-based gaming, this new kind of games also brings new challenges. Some of them are common for all applications on smart phones, like the sparse availability of resources, while others are specific for location-based games, like e.g. the verification of the player position. The remainder of the paper is structured as follows. 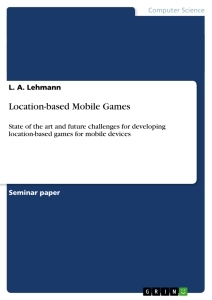 In Section 2 an overview is given over location-based services and location-based games. Section 2.1 shows different game patterns for location-based games and Section 2.6 names several purposes of location- based games where these patterns can be used. Several positioning systems and their usage in location-based games are discussed in Section 3. Section 4 illustrates differ- ences in the game experience between video games and location-based games. Finally, a conclusion is drawn in Section 5 and future challenges are pointed out in Section 6. ”Location-based Services (LBSs) are IT services for providing information that has been created, compiled, selected, or filtered taking into consideration the current locations of the users or those of other persons or mobile devices”. Many applications for modern smart phones incorporate LBSs to provide location-based information. This information can be used to give location-based recommendations, provide navigation information, track movement, conveniently communicate the current location to friends, etc. However, it can also be used in the area of entertainment to create a new kind of games that makes the position of the player an essential part of the game. A location-based game (LBG) is here defined as a form of play that is designed to be played on a device in motion and changes the game experience based on the location. To create a location-based experience usually a connection to other devices, e.g. a server or other players, is used. However, it is also possible for single player games to store all required information on the device itself. Thus a connection is not necessary for a device to run a location-based game as long as the game changes based on the device position. In the following two sections game patterns and usage possibilities of LBGs are de- scribed. Table 2.1 gives an overview on how patterns are used in certain types of games. To use the location in the game several game patterns or a combination of them can be used. In this chapter four common game patterns are analyzed. An graphical overview over these patterns is given in figure 2.1. A popular pattern is the one here referred to as Search-and-Find. In this type of game the player has to find a certain geolocation. Finding the geolocation can involve the actual act of searching if only the rough location is given. However, the player can also be guided to the place by the game using some kind of navigation system within the game. and the size of the game field. This game pattern can for example be used in LBGs for data acquisition, as shown in section 2.11. The basic concept behind the Search-and-Find game pattern is that the player has to reach a destination. This destination is always a fixed point in the game world, meaning that the geolocation for this specific destination does not change. This is also the case if no specific geolocation is given, since the player has then to choose from a range of locations which are fixed. The most famous LBG genre using this pattern is geocaching. In this type of games the player has to find an object which is hidden at certain GPS coordinates. This object is usually a real world box containing various items. The aim of the game is to find this box using the GPS coordinates, choose one of the items stored in the box, and in turn put a new item in the box. A game pattern very similar to Search-and-Find is the one here referred to as Follow- the-Path. Also in this game pattern the player has to reach a destination; however, the focus is not on the destination itself but on the way the player reaches it. It typically involves a certain route that the player has to follow, similar to a suggestion coming from a navigation system. Different from a navigation system, the player commonly receives a penalty within the game if he does not follow the predefined route. The penalty depends on the advantage the player gets from leaving the route. This means that players that take shortcuts in location-based racing games usually lose the game immediately. Besides a strict given route, it is also possible to not give any, but track the player’s movement. Here the player can choose the route by himself but the movement still remains the core game objective. This is for example the case in a game where the player draws on a virtual game board by moving in the real world. In this game his destination is irrelevant since he or other players can just see the picture he painted by moving. The route chosen by a player can also be recorded in order to find the best path between two points in a LBG for data acquisition. The basic concept here is very similar to Search-and-Find with many consecutive points that the player has to reach or can set] by himself. One example here is the game Tourality where the player has to complete a course in a certain time. Since this game pattern is often used for games focusing on physical activity further examples are given in section 2.9. Chase-and-Catch, as defined by Misund et al., is another popular pattern for LBGs. A Chase-and-Catch pattern requires the player to hunt a moving object in the game world. This object can be another player, making the game very similar to the traditional children’s game tag, or a virtual thing only existing within the game world. Usually the player has to reach the object he is chasing or he has to get to know its current location in order to successfully catch it. The basic concept here is that the destination is frequently changing. This can make the game more challenging for the user, depending on the frequency of changes and possible strategies to carry out the catch. This pattern can be used in a single player environment with one player chasing one object, e.g. a hunter chasing a fox, or in a more complex multiplayer environment. This is for example done by the game Shadow Cities where two groups of players have to ”catch” each other with every player chasing and being chased at the same time. A less frequently used pattern is the one here referred to as Change-of-Distance. In contrast to the previously mentioned patterns, this pattern does not involve actually reaching a certain geolocation. The main goal is to get closer to a geolocation or further away. The location itself is not important; it is just the movement that matters. Another distinction is that the direction is not important either. While both Search-and-Find and Chase-and-Catch require the player to move in a certain direction to reach the objective, this is not the case in games using the Change-of-Distance pattern. An example for a LBG using the Change-of-Distance pattern is The Journey, an adventure game where the player can read the next part of the story only after having moved a certain distance. Traditional video games usually exist for the sole purpose of entertainment. Even though there are some games that also have an educational purpose, they usually still focus on entertainment and are far inferior to pure educational software. New video game systems that have been created to combine physical activity with gaming, like the Wii, still stay far behind real sport activities. While it is obvious that several video games or gaming systems have tried to promote other activities and give the player some benefits by playing, this goal has never been reached in an extent degree. Of course all LBGs are still based on entertainment, since they are games and thus involve the act of playing. However, the location-based gameplay makes it possible to incorporate other aspects in a unique way. Based on the already existing market and current research, the following areas have been chosen: entertainment, education, physical activity, advertising, and data acquisi- tion. As mentioned before, all games have the purpose to entertain. However, games in the commercial market usually solely focus on entertainment in order to generate the highest possible revenue. There are very few examples of LBGs outside of research, since only recent smart phones fulfill the requirements to run games for the mass market. One of the games that has been published in Q4 2011 is Shadow Cities. In Shadow Cities the player takes the role of a magician fighting for one of the two factions in the game. He can then use magic spells to defeat hostile players or non-player characters. The factor of the location is included in the game in the way that the game world is an exact map of the real world and the player’s character moves together with the player’s smart phone. Besides the games that are currently being published and use state of the art graphics, text based LBGs have been developed since Botfighters got published in 2000. In Botfighters, a Cell-ID based game, the player had to send a SMS to find nearby players. Once a player was found, he could be shot by sending another SMS.